Powertrak VRoom, a virtual reality mobile showroom, was a key attraction at the ideation 2018 conference in Miami Beach, Florida. 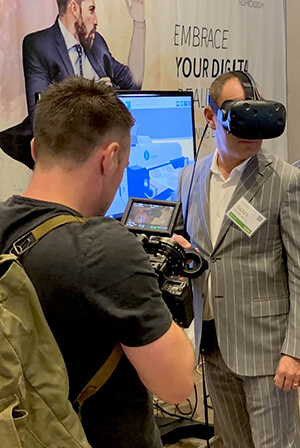 Hundreds of global fashion and retail professionals who rely on CAD and PLM solutions from Gerber Technology visited the interactive, virtual reality exhibit. Powered by Powertrak VRoom and Powertrak 3D Product Configurator, the exhibit combines virtual reality with 3D animation to demonstrate how modern micro-factories pass data from machine-to-machine, automating the workflow, and minimizing human interaction. This immersive experience teaches apparel leaders how digitally-connected machines improve product quality, reduce costs, and speed time to market. The VR exhibit was set up in the Embracing Digitalization Interactive Studio in Salon A at the Eden Roc/Nobu Hotel. Gerber Technology provided a professional-grade VR headset for attendees to visualize and explore the micro-factory environment. The HTC VIVE Pro transported attendees into the virtual room where they could see animated YuniquePLM, AccuMark, Z1 Cutter, and third-party printing and sewing machines moving fabric from design to production. The exhibit was a popular attraction and the user response was overwhelmingly positive. An above view of the virtual design, printing, cutting, and sewing machines working together. Ideation is the premier fashion technology software conference connecting emerging digital solutions to visionaries, disruptors and leaders in fashion and the apparel industry. The three-day conference inspires, informs, and trains business leaders on the latest trends, innovations, and technologies in the fashion and apparel industry. It includes panel discussions, interactive sessions, workshops, and keynote speaker and fashion designer Rebecca Minkoff.